Maureen is a good friend of mine I met while living in Brunei, an amazingly beautiful woman inside and out, she never ceases to amaze me with her creative abilities from Interior Design to being an an incredible cook. Maureen returned to Australia a couple of years ago to pursue her love of food taking over a cafe called Pistache Cafe which she has just sold. I caught up with Maureen recently on Facebook and she was telling me that she is a devotee of the Hummingbird Bakery in South Kensington, London and on a recent trip... (yes she is lucky enough to still jet around the world), Maureen walked and tubed half way across London to visit the bakery and pick up their latest recipe book. 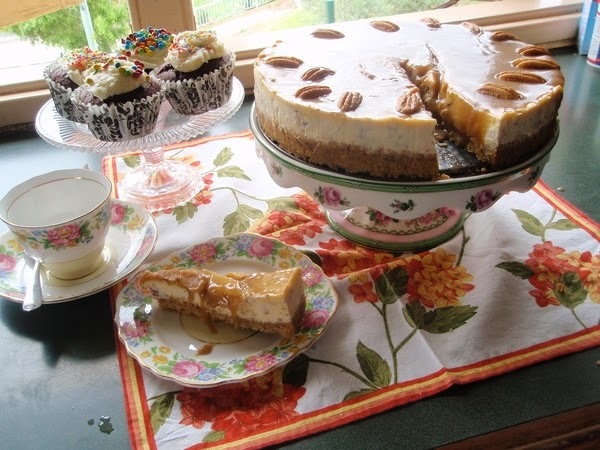 Maureen had just made the most delicious cheesecake from their book and I asked if I could share it my readers. 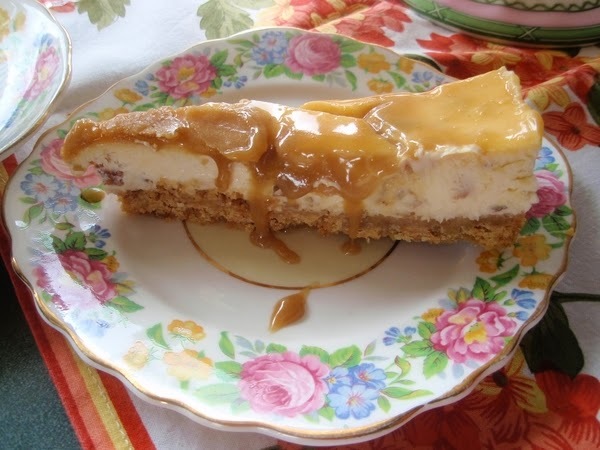 So thank you Maureen for making the cheesecake for us and your wonderfully mouth watering photos and thank you Hummingbird Bakery for your delicious Butterscotch Pecan Cheesecake recipe. If you wish to purchase Hummingbird's recipe books you will find both their popular books on my right hand side bar, if you click it will take you to the Amazon link where you can purchase direct from Amazon. If your mouth isn't watering by now there is something wrong! Finely crush biscuits, I like to do this in a zip lock bag with a rolling pin; add to melted butter, pour into 20cm (8in) spring form cake tin (line base if you prefer), pressing them into base (line base if you prefer), refrigerate for 20-30 minutes. Pre-heat oven to 160C. Using an electric hand mixer cream cheese, sugar and vanilla oil until smooth, add eggs one at a time, mixing thoroughly. Stir in the chopped nuts, pour mixture on chilled base. Place cake in tin foil, then place in roasting tin, pour ¼ inch water into roasting tin to create a steam bath effect. Cook in oven for 35-45 minutes until set and only slightly wobbly in the centre. Remove from oven, cool to room temp in tin, place in refrigerator to set for 2 hours. Place butter, sugar and milk into pan and bring to boil, remove from heat, stir in icing sugar and vanilla oil, whisk until glaze is smooth. 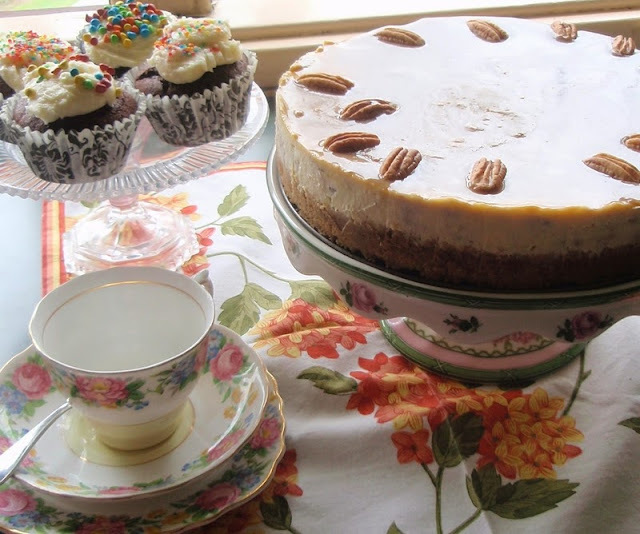 Pour glaze on top of the chilled cheesecake, decorate with remaining pecan halves, return to refrigerator and leave to set for a few hours or overnight. Remove cake from spring form tin, serve! If there is any left over, the cake will keep nicely in the refrigerator, covered for up to 3 days. I agree Andrea, I was drooling over it too! and thinking about the book for myself.